Kakum National Park is one of the best known national parks in Ghana; it is in the southern part of Ghana, in what is known as the Central Region. It is a much publicized canopy walk,which was constructed in 1995 with the support of USAID.Kankum is an excellent place to see forest birds with a checklist of 266 confirmed and another 50 unconfirmed species. It protects some 100 different species of mammal,including the country’s densest population of forest elephant as well as giant forest hog,six types of duiker,bushbuck,bongo,squirrels,leopard as well as spot-nosed monkey. Kakum National Park has a unique tourist attraction: the only year-round tour over a hanging bridge in the forest canopy level in all of Africa. Beside Kakum there are only four other round tours of this type. From the so-called Canopy Walkway, at up to 40 meters height, the visitor can approach the plants and animals in their living space which would otherwise be inaccessible for people. The Canopy Walkway passes over 7 bridges and runs over a length of 330 meters. 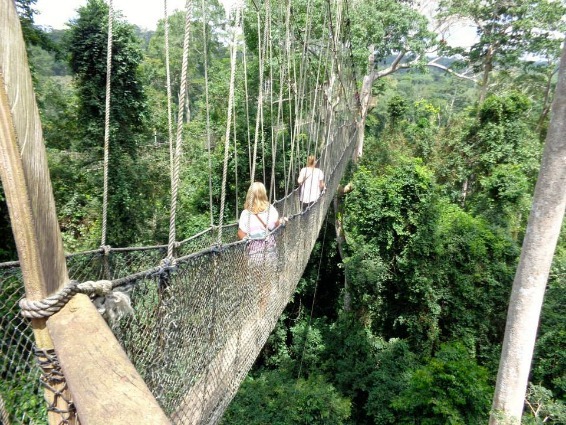 The Kakum Canopy Walk is a must when you go to Ghana! It was one of the first things I did on my arrival in this wonderful country. It's not far away from Cape Coast and easy to get to with a taxi. The park is really nice to walk through, but the Canopy Walk is the nicest thing! You can see all over the park! I had a blast at Kakum! Not only do you get to experience the Canopy Walk but there are many other activities to do while at the park. One of my favorite things I did while in Ghana was stay in the tree hut over night deep in the rainforest! We started the night out with a camp fire, then went on a night hike and after fell asleep to the sound of monkey chatter! Kakum National Park is definitely on a visitor's to-do list! I went to the Kakum Nationalpark with my family who came to visit me in january. We really enjoyed the trip, especially the Canopy Walkway was a real adventure and I can recommend to visit Kakum!